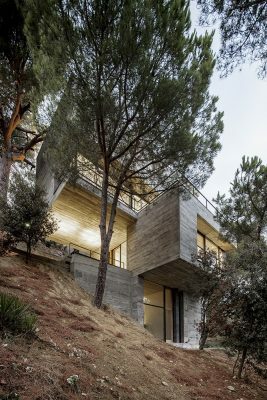 On the one hand, the reduced dimensions of the plot and its complex orography, and on the other the desire to leave the minimum imprint on the land led us to seek out a floorplan which, matching the trees that surround it, emerges from a trunk well anchored to the land. This trunk opens up in braches on each floor, in such a way that each branch becomes the terrace of the upper level at the same time as it becomes the porch of the lower one. 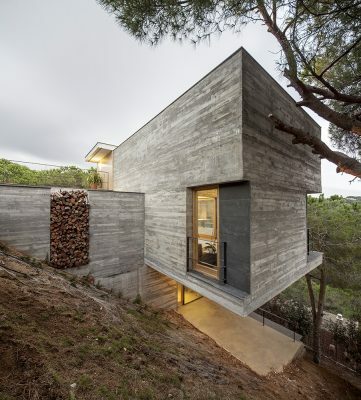 All this helps create a very formal building, with huge cantilevers facing out to emptiness, the woods and the sea which lie before it. 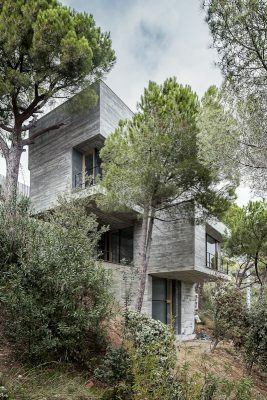 A structure which opens up to these views and the sun, and which thanks to the terraces and the porches confuse the interior with the exterior. 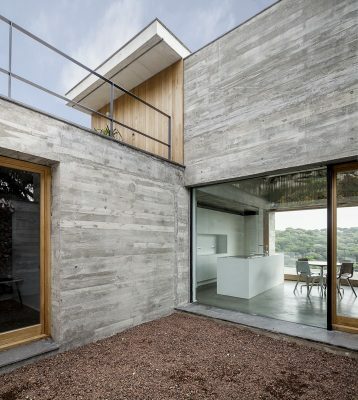 A building which is equally formal in both its volume and the materials which compose it. 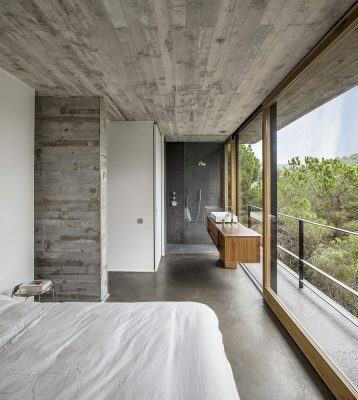 Concrete, iron, timber and stone combining in a way that emphasizes the character of each one. In the end, the whole building represents a dialogue between emptiness and fullness, between materials, between outside and inside; seeking out a balance between these highly contrasting parts. A very difficult plot of land, in the middle of a forest, with exellent views, but so steep that there isn’t an accessible area to do any outdoor activity or plant a garden. 5 7As the trunk of one of the surrounding trees, the smallest base is built to leave as much land as possible untouched, respecting all the trees around. From this main trunk on each floor there emerges a cantiliever that creates a porch for the floor below and a terrace for the one above so the views above the trees can be enjoyed while one is protected form the sun and rain. 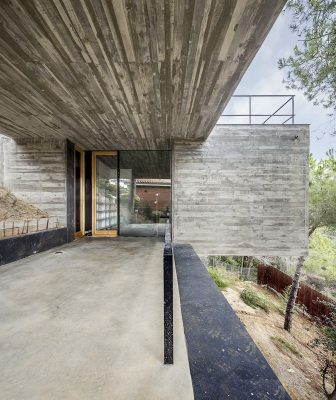 This way we achieve a house open to the surrounding views and light, leaving aside the difficulties of the land. Its complex geometry generates more than 115m2 of terraces, 42 of wich are covered.